We saw a mixed session in Asia as market again reflect headline after headline. 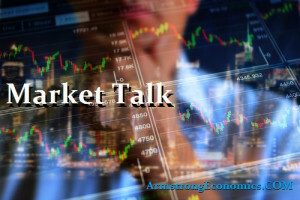 The Chinese markets played catch-up, after their national holiday yesterday and that resulted in a 1.1% rally for the Hang Seng much of which were financials performing. The Yen remains weak even after poor US employment numbers. Net-net was a dull Asian session so back to headline watching. The DXY is returning much of yesterdays gains as futures drift in sympathy with the weak DOW into the weekend. The INR remains mid-range of the past two weeks, not the time for break out just yet. The Euro rallied a touch against USD and that was probably why European stocks wobbled initially. Add into that mix US/China trade uncertainties’, the poor US data and its the weekend and it is no wonder money is being taken off the table. All core was down around -0.4% with light volume and still, the bond market remains lethargic. US jobs data was t]less than impressive for the markets and the early losses seen on futures just accelerated through the day. Towards the close, we were over 750 points lower in the DOW and 2.5% weaker in the S+P. Steve Mnuchin’s comments that there is the possibility of a US/China trade war was all the nervous markets needed on an already hesitant Friday afternoon to have an impact. The market feels let-down also after Powel’s speech failed to offer substance when it was certainly needed. The final thirty minutes saw a 200 point rally in the DOW but guess these algorithms are not that sympathetic. The VIX has rallied 15% and trades around the 21.50 level. Should imagine the ETF markets is seeing outflows so is building for the scramble back-in later in this quarter. Japan 0.04%, US 2’s closed 2.27% (-3bp), 10’s 2.77% (-6bp), 30’s 3.01% (-7bp), Bunds 0.48% (-4bp), France 0.73% (-2bp), Italy 1.78% (u/c), Greece 3.96% (u/c), Turkey 12.67% (-4bp), Portugal 1.67% (+2bp), Spain 1.21% (-1bp), and Gilts 1.39% (-2bp).